Georgia completed her BSc (Conservation Biology and Zoology) and MSc (Zoology) at the University of Western Australia. Her master’s project investigated whether camera traps could be used as an alternative to live trapping to estimate the density of quenda populations and she presented her findings in a poster at the 12th International Mammalogical Congress. Georgia volunteered for DBCA ‘s ‘Return to 1616’ project on Dirk Hartog Island where she radio-tracked banded and rufous hare-wallabies and assisted with vertebrate pit fall trapping. Georgia has also volunteered at Whiteman Park, assisting with woylie and wallaby counts, and at Kanyana Wildlife Rehabilitation Centre where she assists in the rehabilitation of sick and injured wildlife. 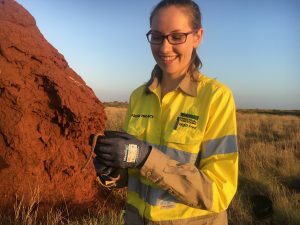 She is experienced in a range of trapping and surveying techniques including cage and aluminium box traps, pitfall traps, hand-capture, camera traps, and radio-tracking. While working for Terrestrial Ecosystems, Georgia has spent time in the Pilbara at the Wheatstone LNG project as a fauna handler and has assisted with fauna relocations on the Swan Coastal Plain. How ‘hot’ or ‘cool’ are Echidnas? Copyright Terrestrial Ecosystems 2013. Website design by Swish Design.